Contract Ammunition Manufacturer | Ammo & Bullet Mfg. Inc. When it comes to ammunition, each cartridge should be made with careful precision and unquestionable accuracy. Whether you’re a professional arms dealer or a law enforcer in training, you don’t want to work with an inaccurate, careless contract ammunition manufacturer. If you’re involved in an industry that handles guns on a daily basis, we both know that there is no room for mistakes. That’s why you need to work with a competent contract ammunition manufacturer with a detailed manufacturing process. What separates us from the common contract ammunition manufacturer is our attention to detail. Over the course of our business as a contract ammunition manufacturer, we have developed multiple steps using state-of-the-art technology to ensure quality in every ammo cartridge we make. On top of that, we also do regular maintenance on the machines we use to make and test our bullets. Ammo and Bullet is a contract ammunition manufacturer that provides different customized and conventional bullets. We work with clients from varying industries on a daily basis. As a contract ammunition manufacturer, we have clients from the police force, military, and even the business sector. Private Label: Ammo retailers may find that working with a contract ammunition manufacturer is more cost-efficient than producing their own. Startups that have no way to create their own line of bullets can hire a contract ammunition manufacturer to produce the bullets they need. Similarly, even if you do have your own factory, if the demand for bullets is much higher than your capacity to supply, then that’s where a contract ammunition manufacturer can help you. As your chosen contract ammunition manufacturer, we’ll customize and package your ammo products to suit your needs. We’ll do our best to ensure that our goods exceed your expectations. Shooting Ranges: We’re a contract ammunition manufacturer that caters to all types of indoor and outdoor firing ranges. Ammo and Bullet understands that every club has different ammo needs. That’s why we’re a contract ammunition manufacturer that goes the extra mile to deliver whatever it is that you need. Whether these are lead-free bullets for a safer indoor shooting experience or a more environmentally friendly round of ammunition for outdoor shooting, we’re the contract ammunition manufacturer that does it all. Law Enforcers: Ammo and Bullet is a contract ammunition manufacturer that caters to both local and international police organizations. We understand how difficult it is to be a law enforcer. Late nights, early mornings, plus the constant threat on your life come with the job. That’s why we know the impact it makes if your contract ammunition manufacturer fails to meet your specific requirements. Luckily, we’re a contract ammunition manufacturer that has everything you need. Whether you require lead-free bullets, hollow-points, or frangible rounds, then you’ve come to the right place. Military: When you’re putting your life on the line for your country, you have no need for an incompetent contract ammunition manufacturer. Luckily, Ammo and Bullet is far from being mediocre. 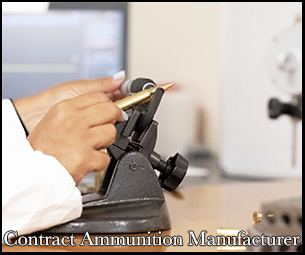 In fact, we are a contract ammunition manufacturer that employs multiple layers of security and protection to ensure the quality of each cartridge we deliver. Because of this, we have successfully formed partnerships with different sectors of the military that are looking for a contract ammunition manufacturer. As a contract ammunition manufacturer, we would be honored to provide you with the rounds you need to preserve the freedom our country enjoys today. To learn more about how much ammo homeland security purchases, read this: https://www.forbes.com/sites/ralphbenko/2013/03/11/1-6-billion-rounds-of-ammo-for-homeland-security-its-time-for-a-national-conversation/#45d950d7624b. Need a Contract Ammunition Manufacturer? If you’re looking for a reputable, qualified contract ammunition manufacturer, turn to Ammo and Bullet. We’re a contract ammunition manufacturer that provides ammunition solutions to entrepreneurs, military forces, and law enforcers. Whether you’re looking for weapon-specific ammo or crates of hollow-point bullets, we’re the contract ammunition manufacturer you need. Just shoot us an email to learn more about us and how we can help you with the rounds you need. Our company aims to be one of the suppliers for the military. We believe that reliability is a necessity, especially when lives are on the line, and that’s why we are dedicated to providing high-quality ammunition. We offer quality rounds designed for any military mission. For special situations, we also create custom ammunition. Click here for more information about what we provide for the military.